The Architecture Development Method (ADM) is the core of the TOGAF framework, offering clear steps for developing or altering enterprise architectures. But how does the ADM work? How can it benefit businesses and enterprise architecture students? Mike from Good e-Learning is here to tell you! The Architecture Development Method (ADM) lays at the heart of The Open Group Architecture Framework (TOGAF). It provides a succinct step-by-step process for the development or alteration of enterprise architectures. At the same time, it remains fluid enough that it can be adapted to suit the specific needs of individual TOGAF practitioners, regardless of their industry, location or the size of their company. But how does the ADM work, and how can TOGAF benefit your organization? In this video, Mike from Good e-Learning discusses the 10 phases of the renowned architecture development cycle. Good e-Learning offers award-winning TOGAF courses, having received the ‘Outstanding Certification Product’ prize at The Open Group Awards 2018, an event hosted by the developers of the TOGAF standard. Our enterprise architecture course portfolio is extensive, with choices for both new students and certified practitioners. 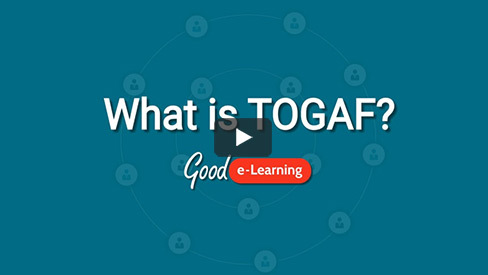 Those seeking an introduction to TOGAF can take the TOGAF Awareness course, while our TOGAF Foundation and Certification options are ideal for students who want to become qualified in the TOGAF framework. Certified TOGAF practitioners can also benefit from studying with us thanks to the TOGAF Essentials 2018 course, which can help users update a TOGAF 9.1 certification to 9.2. We even offer a combined TOGAF and ArchiMate course which can equip students with both the TOGAF framework and the renowned ArchiMate modeling language.